Parking available by the sports centre round the corner as double yellows near the church. 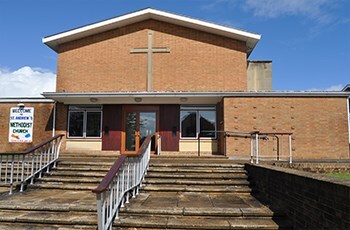 There has been a Methodist Church in Filton since the first half of the 19th century initially meeting in the loft of a carpenter's shop. In July 1832 an agreement was made between the carpenter and a preacher from the Ebenezer Wesleyan Society at Old King Street, Bristol, which resulted in the building of a chapel 35 feet long by 16 feet wide. This chapel served the Methodist community in Filton for nearly 100 years. By 1916 it was felt larger and more modern premises were needed and with the help and encouragement of members of Old King Street and Bishopston Chapels the new chapel situated at the top of Southmead Road was opened in 1925. Not long after 1925 a need was felt to enlarge the premises or build a new chapel retaining the existing building as a hall. A site was found on the corner of Elm Park and money-raising activities began. The war intervened in 1939 soon after which road widening caused difficulties for the proposed enlarging of the chapel. The problems were resolved when the Bristol Methodist Council decided with the agreement of the Trustees of Old King Street Chapel that the compensation for the demolition of Old King Street Chapel in connection with the development of the Broadmead shopping area, should be used to build the present Church at Elm Park, designed by the architect J Ralph Edwards.